New Trend Shows Kids Snacking Every Few Hours Not only are kids snacking more compared with a generation ago, but they're noshing on increasingly unhealthful snacks. 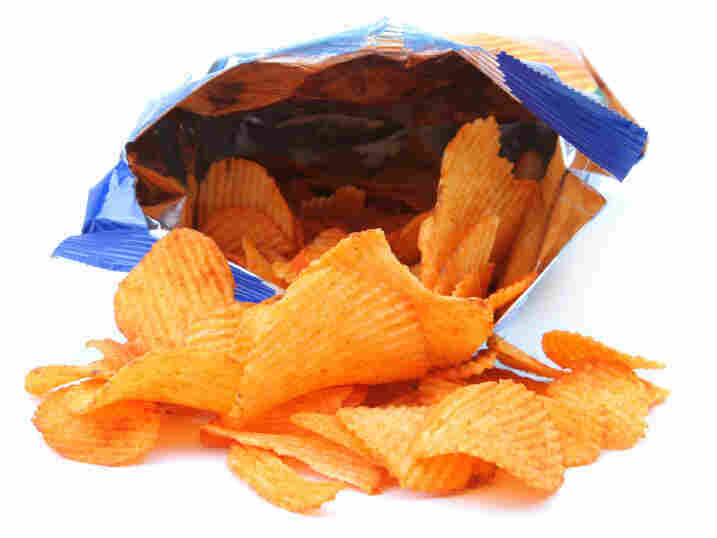 Kids tend to eat calorie-dense and nutritionally poor foods, like salty and fatty snacks. And, they're starting these behaviors earlier in life, with kids as young as 2 having increased their snack intake the most. Snack time, again? Gone are the days when parents forbade their children to snack in between meals. The trend these days seems to be toward continuous eating. "My data shows that kids are eating every few hours now," says nutrition researcher Barry Popkin of the University of North Carolina. "This is not the way it used to be." Childhood snacking trends are moving toward three snacks per day as compared with 30 years ago, when children ate an average of about one snack a day. These findings come from a national survey that included over 31,000 children and adolescents, ages 2 to 18. "The average child today is getting 586 calories a day from snacks," says Popkin. This represents an almost 200-calories-a-day increase compared with snack calories consumed by children a generation ago. And many school-age kids — about 1 in 5 — are snacking up to six times a day. Researchers say all this snacking wouldn't be worrisome if kids were munching on healthful, nutrient-rich foods. But this isn't the case. "They've cut down on fruit intake, and they've cut down on milk intake," says Popkin. These consumption trends have also been documented by the U.S. Department of Agriculture. Nowadays, kids are consuming more salty snacks, candies, fruit juice and soft drinks. "So we've essentially moved from healthy foods to unhealthy foods," explains Popkin. One of the most striking trends is the snacking habits of the preschool set. According to the new analysis, children ages 2 to 6 are consuming the highest number of snacks per day. On average, they're eating and drinking an extra snack or two per day compared with preschoolers in 1977. "This is a real concern" says Eileen Kennedy, dean of the Friedman School of Nutrition at Tufts University. "Not only are children's dietary patterns changing, but their physical activity levels are changing, too." All this snacking at such young ages, Kennedy says, may be the beginning of poor lifelong eating habits. The rise in childhood obesity coincides with this trend toward frequent snacking. But parents don't seem to make the connection — or notice when their children are becoming overweight. "We just don't see it," says Marlene Schwartz of the Rudd Center for Food Policy and Obesity at Yale University. She says as eating habits have changed over the past three decades, so too have our perceptions about weight. Recently when she looked back at class pictures from her elementary school days she was struck by how thin all the kids seemed. "You look and you think, 'Wow.' Those kids are so skinny," says Schwartz. But, actually, the kids in her photos were average. To make this point, Schwartz analyzed the body mass index data of current students in the suburb where she lives, just outside New Haven, Conn.
"People were shocked that even in our town, rates of childhood obesity were right up there with the national averages," says Schwartz. People don't understand how difficult it is to visually assess whether a child is obese or overweight because we've gradually gotten used to bigger children.